Written by Aviva Romm M.D. Just recently a patient came into my practice feeling fatigued, moody, was having heavy periods, no libido, and was bothered by constipation. She also wasn’t sleeping well – waking up too early in the morning and unable to fall back to sleep, and she’d gained 7 pounds in just a couple of months even though she hadn’t changed her eating habits. All are signs of hypothyroidism. We talked. She really didn’t feel that stress was causing her symptoms – nothing in her life was really that troublesome. She had no outlier symptoms that suggested another diagnosis. She was pretty sure something was wrong with her thyroid so she’d asked her primary doctor to check her thyroid labs before scheduling to come see me for a more integrative medicine consult. He’d checked her thyroid stimulating hormone (TSH) test only, and told her that since it was still in the normal range, even though it was at the upper end of normal, she did not have a thyroid problem. He sent her on her way suggesting that maybe an antidepressant would be good to consider. But her labs weren’t normal. One step over a very thin line and she’d have had a slam dunk diagnosis of the most common thyroid problem: hypothyroidism. And in fact, this is what I diagnosed. She started appropriate treatment and her energy and symptoms quickly began to improve! This is a typical story. Hypothyroidism is the most common thyroid problem, and Hashimoto’s disease, an autoimmune form of hypothyroidism, is the most common form of all. Women are much more likely than men to have thyroid problems. Hypothyroidism can appear at anytime but is especially common after childbirth and is prevalent in woman in their 40s and 50s. Yet so many doctors seem reluctant to do an adequate work-up of thyroid function. Some even refuse! This seems strange given how common thyroid problems are, and yet they are quite willing to freely prescribe antidepressants. My patient’s doctor was doing just what we were all told to do in medical school – check the TSH and if that’s within what we were told is the normal range, there’s no problem. But there’s much more complexity to thyroid testing than that! Sadly, so many women are left believing that their symptoms of depression, fatigue, joint aches, weakness, weight gain and more are all in their head! Perhaps this has even happened to you. In reality, your symptoms could be due to hypothyroidism. Because these symptoms are so common to so many women, hypothyroidism is often dismissed as “just normal symptoms” or depression! One patient of mine was accused of overeating by her primary doctor as the cause of her weight problem when she actually had a thyroid problem! There are 6 key tests that can unlock the mystery of your thyroid function and are what your doctor should be looking at. Thyroid testing should be simple to obtain from your primary doctor or local lab. However, the nuances may take some skill to interpret, depending on the results, and your doctor might be resistant to ordering more than the TSH test. That’s where an open-minded endocrinologist or a skilled integrative or functional medicine doctor can be of help. In my practice, if my patient’s symptoms are highly suggestive of hypothyroidism, I will run the entire thyroid panel described below right up front. If there are other diagnoses that are equally likely, I will run just the first 3 tests (Panel 1), and if these come back borderline or positive for thyroid or thyroid hormone problems, I will then add in the remainder of the test panel (Panel 2). I will also sometimes recheck test results for TSH, FT3, and FT4, if normal in a newly symptomatic patient, in 6-12 weeks, because I’ve occasionally seen initial testing be normal then a short time later, voila – the tests come back confirming the problem. Thyroid Stimulating Hormone (TSH) is produced in a part of your brain called the pituitary gland. The job of TSH is to tell the thyroid gland that it’s time to get busy producing more thyroid hormone. When the healthy thyroid gets this chemical message, it produces two hormones: triiodothyronine (T3) and thyroxine (T4). The normal range for TSH is somewhat controversial. Most labs consider the upper range to be between 4 and 5 mU/L. However, many experts – even in conventional endocrinology – believe that the upper end of normal is actually more like 2.5-3 mU/L. 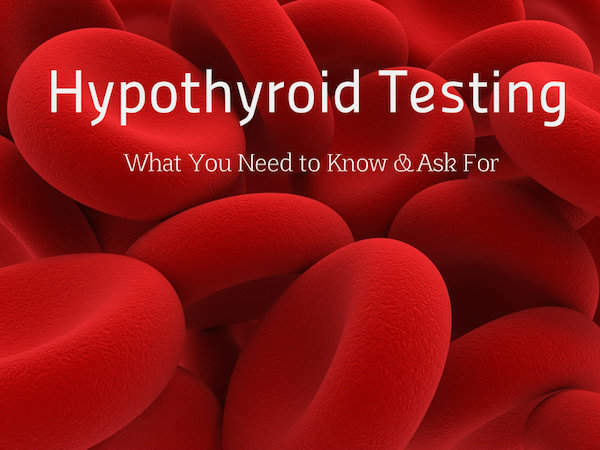 This is based on the fact that when Americans without any hypothyroid symptoms have this test done, that is the most usual upper range. Many integrative and functional medicine doctors find that their patients feel their best at an upper limit of 1.5-2 mU/L. My patient was one of these people. At a TSH of 4 she was really at the upper limit of normal, over the preferred upper limit according to some docs, and well over the 1-2 mU/L upper range! This controversy and discrepancy of opinion over the normal upper range for TSH is one of the most common reasons that women get under-diagnosed for hypothyroidism and suffer with unnecessary symptoms that can seriously interfere with health and quality of life. In most cases hypothyroidism occurs because the thyroid gland is sluggish – that is, it is having trouble producing T3 and T4. This can be due to a variety of reasons ranging from nutritional deficiencies to autoimmunity. So TSH gets pumped out in a higher amount to try harder to stimulate the thyroid gland into action. Think of it like this: You are TSH. Your best friend’s house is the thyroid gland. When you go to visit your friend you knock on her front door. If she doesn’t answer, what do you do? You knock louder to get a response. In just the same way, the TSH amps up to knock louder, hoping to get an answer. That’s why an under-functioning thyroid shows up as high TSH on lab tests. However, TSH can be normal in the presence of hypothyroidism in some cases, and you can still be having the symptoms of low thyroid when TSH is normal because of poor conversion of T4 to T3 (see below) or because of thyroid hormone resistance at the level of your cells. When stress is suppressing the pituitary gland enough to interfere with producing TSH, you might see low or normal TSH levels in the presence of low thyroid hormone production (T3 or T4), and hypothyroid symptoms. Thyroid antibody testing is ordered to diagnose the autoimmune thyroid disease Hashimoto’s Thyroiditis and distinguish it from other forms of thyroid dysfunction. Reverse T3 is the third most abundant form of thyroid hormone. When your body wants to conserve – rather than “burn” – energy, it will divert the active T3 into an inactive “reserve” form. This might happen when you are sick, under stress, or undernourished. If TSH and FT4 look ok, but FT3 is low this can be because it is being diverted into rT3 – which will be elevated. It is worth checking rT3 if there are obvious symptoms suggesting hypothyroidism, but the typical tests aren’t demonstrating low TSH or low FT4. There is some controversy amongst conventional doctors about the utility of this test – I personally find it very useful. If labs return showing that there is hypothyroidism, then I also test for deficiencies of selenium, iron, and zinc and make sure there is adequate dietary intake or supplementation if needed, and look for environmental factors that can interfere with iodine utilization, for example, fluoride and bromide exposures from water and flame-retardant products, respectively. I will then also start to look more closely for other underlying causes, for example, gluten intolerance, heavy metal exposure, and other environmental triggers. Adrenal stress is a biggie for hypothyroidism patients, that few mainstream doctors consider. Our bodies, in their infinite wisdom, work very hard to protect us from overwhelm, fatigue, stress, and even the challenges of environmental toxins, inflammatory foods, and hidden infections. They do this through a set of tiny but powerful glands called the adrenals, that sit one on top of each kidney, that produce a hormone called cortisol. The thyroid’s job is to regulate how much energy we burn or conserve. When we’re under a lot of stress, or other exposures that we need a lot of energy to manage or repair from, the adrenals, through cortisol as a messenger, tell the thyroid to save energy – and voila! The thyroid slows down to protect those precious energy resources and we end up with hypothyroidism. Also, because the adrenals control inflammation and our response to infection, when we are overdriving the adrenal system, or have depletion in that system, our ability to control our immune system becomes compromised and we can get both reactivation of old infections like EBV that can affect thyroid function, as well as autoimmune reactions that can lead to Hashimoto’s. As a doctor, I can tell you that in medical school we are taught that doctors know best. But this is often not the case. You are your body’s best expert. After all, you live with you all the time! And you have a right to ask for basic testing and receive it. We’re not talking about tens of thousands of dollars in MRI’s and CT scans here – we’re talking about modest amounts of blood work. That said, do discuss your symptoms with your doctor because there’s a lot of hype in the natural medicine and natural products world, and your doctor is possibly just trying to protect your from the opposite problem – getting OVER-diagnosed or misdiagnosed with a thyroid problem – and believe me, I’ve also had many patients who were put on thyroid medications by integrative practitioners when these meds were not needed. If you are unable, however, to have an honest conversation with your doctor, if you feel your doctor is not listening or is condescending, then that’s another issue. You should be able to have mutually respectful conversations with your care provider, to get the answers you are seeking, and to be able to explore your concerns. If you can’t, then figure out whether the obstacle is in your being unable to speak up because of a perceived power differential (many of us become weak in the knees when we face our doctors, especially if we feel vulnerable about our health) or whether your doctor is just not communicating respectfully. And make the change! Dr. Aviva Romm is the mother of four grown children, a Yale-trained physician specializing in integrative medicine for women and children, a midwife, an herbalist, and an award-winning author of 8 books including The Adrenal Thyroid Revolution. Aviva is the recent Past President of the American Herbalists Guild and a founder of the Yale Integrative Medicine program. Does anyone know of an Endocrinologist in Houston, Texas that is good? I have been to 3. Supposedly, i have something called Thyroiditis. I feel like crap all the time, have dizzy spells and my levels are supposedly within normal levels. So confused!! I have a 21 month old granddaughter who at 1 had a TSH level of 7 and sent to a Endocrinologist who put her on Levothyroxine for possible Hypothyroidism 3 months later her TSH was 1.79 and Free t4 was 1.52 and then 3 months after that TSH was 2.78 and T4 was 1.58 and now TSH is 1.71 and T4 is 1.69 Dr says this is all normal and too continue medication until she is 2 and a half 3 years old but unable to say if she has hypothyroid or will in the future the numbers seem all over the place, Any thoughts?? I have been taking levothyroxin for over twenty years with no relief from symptoms. I fear I have adrenal issues now from the on going stress of living with a narcissist for years without realizing it. What tests should I ask for, and what things can I do to reverse this. I also suspect leaky gut. THIS COULD BE ME EXACTLY! Find a good doctor. If they blow you off, find a better doctor. Get your health under control, and then determine whether you can get rid of your narcissist. AND beware. I divorced mine and married another one. Choose very wisely. And God bless you.